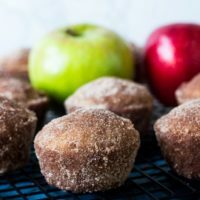 I have had this idea for apple cider donut muffins for several years now and have tried to make them with flop after flop. Either they were dense and chewy or tough and didn’t rise. Each year I tried again and kept getting closer, but not quite there. This year, I nailed it and I’m excited to share it with you. 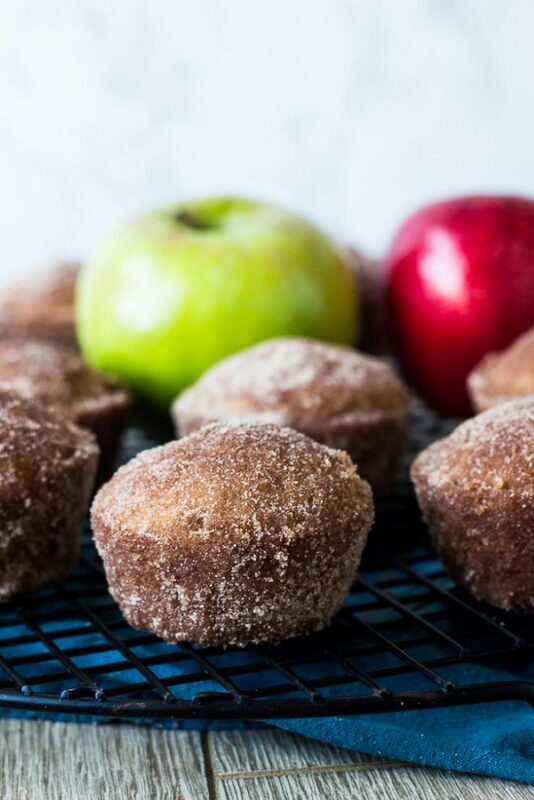 If you’ve had an apple cider donut, you know they are never overpowering in apple flavor, but the best ones definitely have that sweet and subtle apple cider flavor. 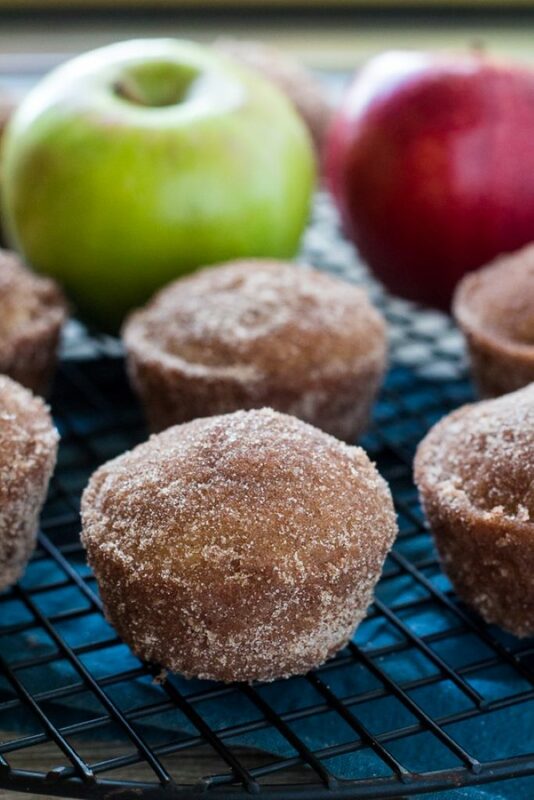 Part of the problem of making good baked apple cider donut muffins, is getting a good apple cider flavor. I achieved this by reducing the fresh apple cider. Simply take 1 cup of apple cider, put it in a small saucepan over medium heat and simmer until it is reduced by half. The 1/2 cup of reduced apply cider has so much more flavor than plain cider. I know this may be self explanatory, but in my research on apple cider donuts, I came across complaints which mentioned using apple cider vinegar instead of apple cider. I just want to be clear here, DO NOT use apple cider vinegar. This recipe is meant for the sweet apple cider which is like apple juice, only way better! 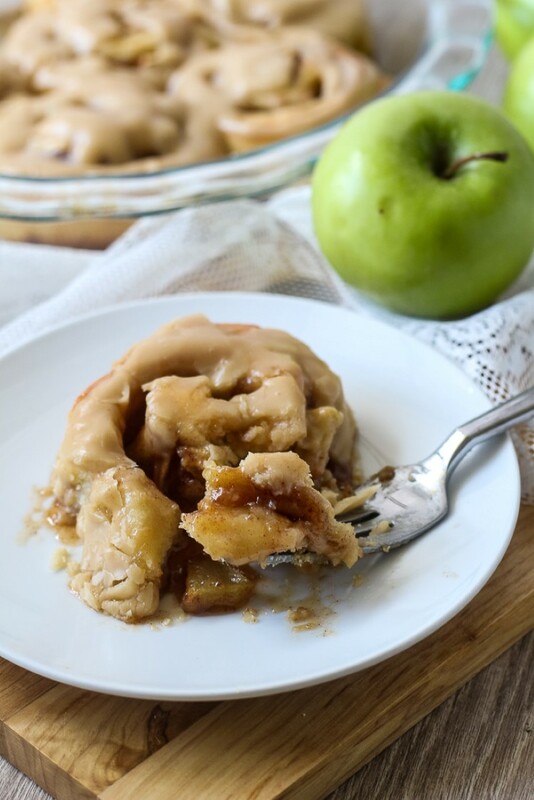 Using fresh pressed, unpasteurized apple cider is best for this recipe. One of the variables that I can’t control is what variety of apples were used in the cider and how sugary it is. The amount of sugar in the recipe will affect the final texture. 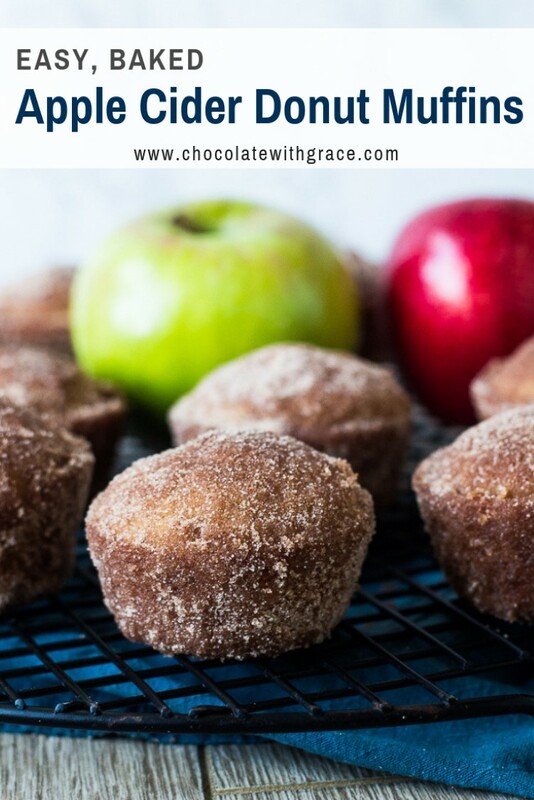 If you end up with too chewy muffins, it probably means there was more sugar in your apple cider than mine. You can try and reduce the sugar in the recipe by a tablespoon or so to account for this. Pour the apple cider into a small saucepan and place over medium heat. Simmer until reduced to 1/2 cup. Let cool. Preheat oven to 350 F. Grease and flour a regular sized muffin tin with 12 wells. Make sure it is well greased. Stir together the melted butter, brown sugar, eggs, vanilla and cooled apple cider in a large bowl. In a separate bowl, whisk together the flour, baking powder, salt, cinnamon and nutmeg. Add the dry ingredients to the wet alternately with the buttermilk. Stir until just combined. Divide the batter evenly between the 12 muffin wells. They should be 1/2 to 2/3 full. Bake at 350 F for 16 to 18 minutes or just until a toothpick inserted comes out clean. Remove for pan to cool on wire rack. Stir together the granulated sugar and cinnamon for the topping in a small bowl. 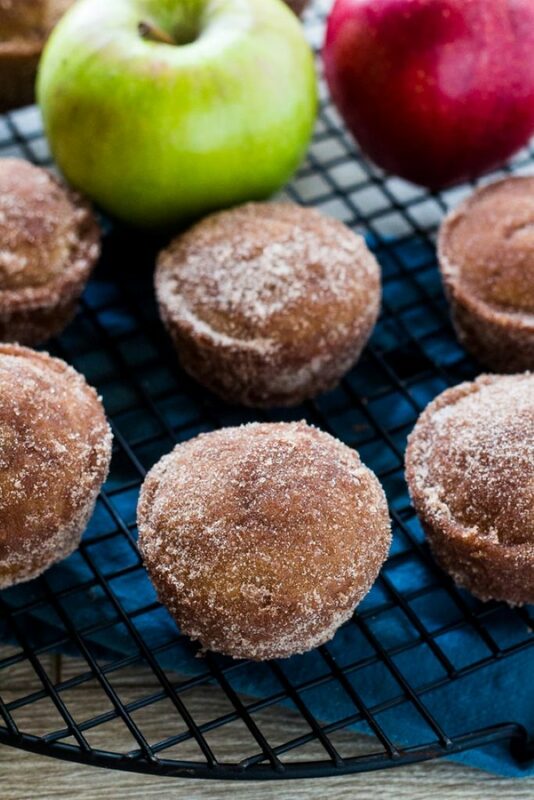 Dip or brush each muffin with melted butter and coat with cinnamon sugar. The keep well at room temperature for 2 days. If you’re looking for a traditional fried apple cider donut, try this recipe from Taste of Home. 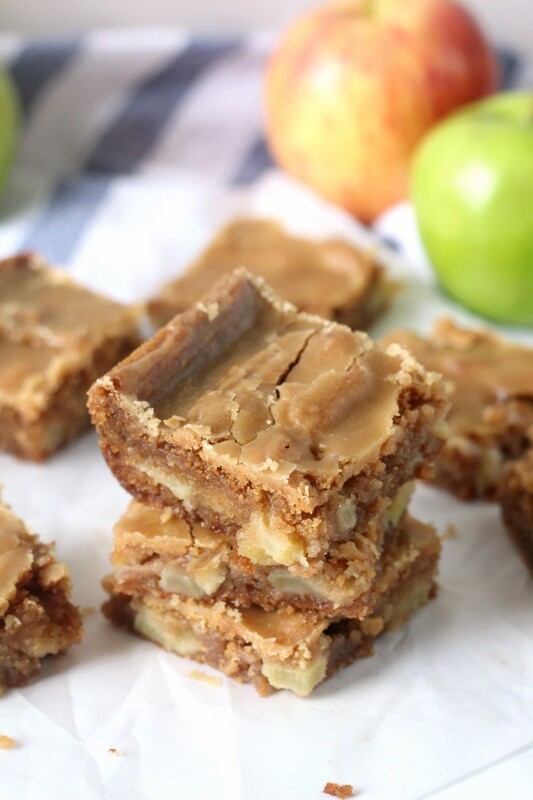 Here are my other favorite ways to enjoy apples in the fall. Perfect for fall! Love that cinnamon sugar topping! This is actually my favorite way to eat donuts–baked in a muffin tin. Hooray for apple and cinnamon! Oh my gosh these sound AND LOOK divine! This is the perfect Fall muffin! Looks so yummy! Thanks for sharing! Donut muffins. So easy and delicious. AND who doesn’t love apple cider doughnuts? YUM. 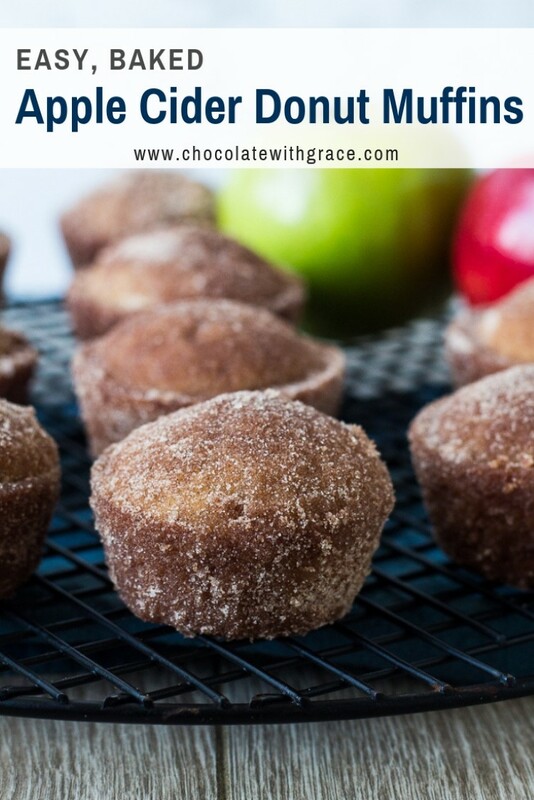 Our family loved these donut muffins! Love the sugar/cinnamon crunch and the tanginess from the apple cider. My son ate six of them….the rest of us were lucky to get any at all! I had a little dab of batter left after filling the tins as much as I dared, so I put it in a ramekin and microwaved it for a few seconds. It was delicious that way too.